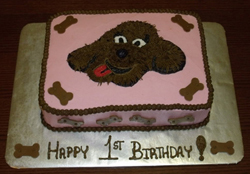 1st birthday cake ideas can seem as though they are impossible to decide on. After all, the sky is the limit when it comes to your child's 1st birthday! There are so many choices, which way do you turn? Take a deep breath and let's look at some of the possibilities. Kids are so easy to please and they are your biggest fan (which may be due to the fact you are supplying the yummy cake but, none-the-less, we will take what we can get, RIGHT?!?). 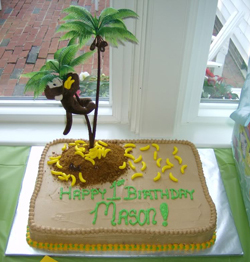 For 1st birthdays, it is completely acceptable to go with a fancy multi-tier cake or a custom decorated character or shape cake. Trust me; you will NOT lose this battle. Anything goes for your favorite munchkin! 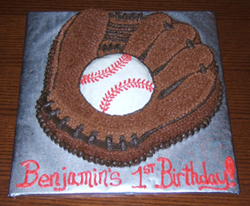 1st birthday cake ideas generally start with the knowledge of the child's interest thus far. Maybe they like a particular cartoon character or have a favorite book. These can be turned into the ultimate cake for their 1st birthday. If they do not have a particular interest, fear not, we have more ideas for you. 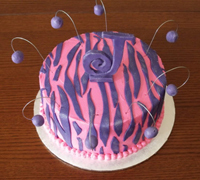 There are many cakes that can be tailored to a girl or boy theme. The boy or girl themed cake can be decorated with your colors associated with the genders and standard decorations like; ribbons, flowers, castles for girls and for boys, trains, baseballs, soccer balls and footballs. There really is no way to do your cake wrong. There is also no need to spend days in the kitchen in order to provide a "WOW" factor at your child's 1st birthday party. There are many cakes that take little effort with the right amount of planning. Fairy cake- This cake is delish made with a vanilla sponge cake and vanilla buttercream filling. You can choose to decorate with fondant or butter cream icing (they will both look very nice and not to mention YUMMY!). You can choose to add a fairy figure to your cake using fondant to mold her out. Fondant is very easy to work with. Modeling chocolate works well too but you need to be sure that your chocolate will stay firm enough and not fall due to temperatures. 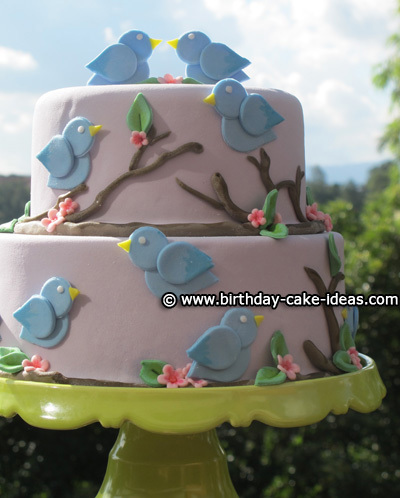 This cake is beautiful in pastel colors or more vibrant shades. A classic hit amongst many little girls. Polka Dot and stripes cake- This is a very modern cake for little girls. Composed of a single tier or multi tier cakes, this is a fun and simple themed cake. It is ideally made with doubled layered cake in the 6" and 8" rounds sizes. You could also use square double layered cakes. These cakes can be any flavor of your choice and are typically covered in fondant to keep the crisp and clean look. A solid color for the base fondant works best. Once you stack and cover your cake, you will want to then add your polka dots and stripes to your cake. These are also typically made with fondant for the crisp appeal to your cake. This also helps to keep your cake firm. 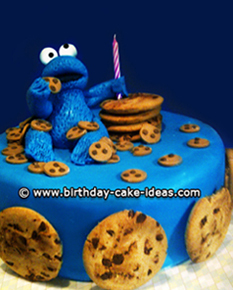 Character cakes- Using character shaped cake pans, make your child's birthday wish come true. Provide them with a delicious Dora or Tinker bell cake with the help of the cake pans. Bake any flavor cake that you like and decorate to match the standard colors of the character or get creative with your own inspirations. A car cake- This cake can be made in many different variations (as with any cake). For this cake idea, we will go with a simple and easy throw together cake. This cake will consist of a triple layered 8" or 10" round cake. For even more excitement aside from the decorated cake itself is to use a checker board cake to keep the "racing" theme. You can also use fondant or buttercream to ice the entire cake. Once iced, using black icing of your choice, create a "race-way" around the outside diameter of your cake. This will be your race track. You can make it any width that you choose. In the middle of the cake, use green icing to create a grassy field and this is also where you can write your "Happy Birthday...". 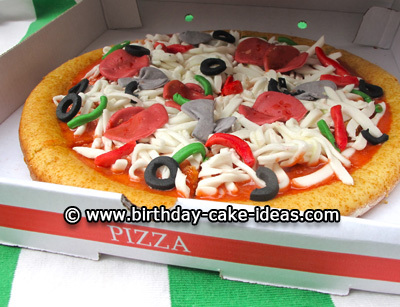 As for the cars, this is where you can get really creative or choose to use store bought items to finish your cake. The cars can be hand crafted from fondant or you can use cars bought from a local store that are non eatable. Either way, your finished product will be delightful. You can also choose to create icing decorations using various cake tips along the sides of your cake. YUMMY! A Ball cake- This is sports themed cake. I simply say ball because you can use this for more than one type of sports ball like, soccer, baseball and basketball. They will all have the same bases to them but merely be decorated and colored differently. As for the cake itself, this is where you will find yourself getting very creative with your skills or using more modern tools to assist you in creating the shape of your cake. If you choose to "carve" out the call shape of the cake, I highly recommend using pound cake for your cake. This will allow you the dense and firm cake that you will need to withstand the cutting and carving (not to mention, that is my favorite cake!). You can also use shaped cake pans that already create the shape for you and you simply bake the cake. To decorate, you can use buttercream of fondant for the base icing before adding detailed decorations to help your cake come alive. I personally like the buttercream on these cakes but either will do just fine. Add your lines to your cake once your base icing has been finished and set. You can use cake decorating tips to give it a fantastic look. Character cakes- just the same as with the girls, you can buy cake pans that give you a detailed "canvas" to work with and merely only require decoration after baking. Think of tracing something when you were young. That is what you will do while decorating these cakes. Simply follow the outlines set in place from the cake pan. These cakes are creating using buttercream icing and decorating tips. Each cake can be made in a variety of ways, there is no wrong way to bake your cake (well..you understand what I am saying!). All of the cakes mentioned above make for excellent 1st birthday cake ideas that you can adapt or build upon to fit your needs. Now get your confection juices flowing and get to create a 1st birthday cake masterpiece! Want to add your Birthday Cake to our Website?